The Aqua Brush Duo is a water-based ink pen that was especially developed for artists and designers. The outstanding properties of the dual tips on these pens enable the user to produce beautiful brush effects. 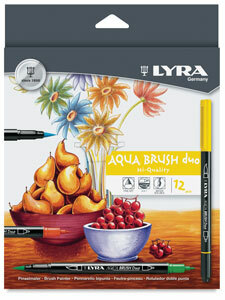 These brush pens are ideal for laying down fine lines and shading large areas of color in pictures and layouts.